Social media users in Kenya have been poking fun at President Uhuru Kenyatta over his perceived enthusiasm for launching projects, with great fanfare from his communications staff. Critics say some of the projects "launched" by the president were already under way or had already been commissioned. Some others have been viewed as not meriting the weight of presidential publicity. 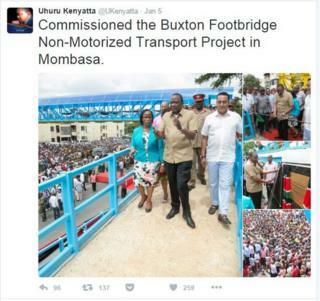 Last week, Mr Kenyatta, who faces elections in August, was in the city of Mombasa where he launched a footbridge, proudly described as a "non-motorized transport project". Some Twitter users have taken this as a cue to mock the president. Using the hashtag #UhuruChallenge, they posted their own examples of things they were "launching" or "commissioning". Some parts of Kenya, including the capital, Nairobi, coastal and northern regions have been suffering power outages since the weekend because of a technical problem at a power station. Perhaps inevitably, this provided another opportunity for satirical digs at Mr Kenyatta. And one user thought Kenyans were unlikely to have heard the last of unimpressive presidential launches.